It is that time of year. Here in America, one can not help but be affected by it. For most, it is a time to get together with family; warm, fuzzy feelings abound. Many show a little extra vibrancy in their step. Moods tend to be better, especially among shopkeepers as they survey their cash drawer. For many it is the holiday season; holiday being a generic term which avoids the politically incorrect pitfall of mentioning Christ. "Season's Greeting" and "Happy Holidays" seem to be a pretty safe middle of the road greeting that many would choose in order to avoid the chance of offending anyone. And there are many just waiting to be offended here in the States! There are the Muslims who see the Christmas season as just another manifestation of the lasciviousness of the infidels. New Age cultists see the season as theirs, since they lay claim to the winter solstice from a time long lost in history. Our Jewish friends have been celebrating the re-dedication of the Temple in Jerusalem at this time of year since before the time of Christ. Even among professing Christians there are little known but profound disagreements. Most Christians accept Christmas as the celebration of the birth of Jesus unquestioningly. A few Christians reject Christmas as a Popish invention aimed at integrating pagans into the church. It is a not-so-well-known fact that this was the popular view here at the time of the founding of this nation. To be frank, it does sometimes give me pause that the holiday is called Christ-Mass. That child was indeed the Son of God and the Son of Man. If Jesus had not been born of Mary, he would not have been a suitable sacrifice for mankind's sins. If God had not been his father, Jesus would not have had the ability to live a sinless life, again making him an unsuitable sacrifice for mankind's sins. Jesus fulfilled what he was born to do. He died a cruel death on the cross in our place, to pay for our sins. Now, since these thing are most certainly true, wouldn't this be a good time to humble yourself before your God, repent of your sins, and follow Christ? Forgiveness is a central theme of Christianity. As it applies to the forgiveness of man's sin by God, there seems to be little dispute about why it is imperative (at least among Christians). The subject of how forgiveness applies to wrongs committed by one man against another, seems to be one fraught with more misunderstanding. When dealing with wrongs committed by one man against another, they are of two possible types. The first concerns a Christian wronging another Christian. I don't intend to address that here, because frankly, I just have a hard time seeing how such a situation could last very long if the first biblical command concerning such a situation is followed. Namely Matthew 18: 15. Really, that is all that should be required to iron out issues between two Christians. The second concerns a Christian being wronged by a non Christian. I suppose that means there is another type; a non Christian wronging another non Christian, but since neither of them would be too concerned with what the Bible teaches, there is not much point considering them here. Matthew 18:21-22 "Then came Peter to him, and said, Lord, how oft shall my brother sin against me, and I forgive him? till seven times? Jesus saith unto him, I say not unto thee, Until seven times: but, Until seventy times seven." Mark 11:25 "And when ye stand praying, forgive, if ye have ought against any: that your Father also which is in heaven may forgive you your trespasses"
These seem to be the verses upon which many Christians base their understanding of forgiveness. Often Christians are told that they must unconditionally forgive others for the sake of their own health and so that their sins can be forgiven. While there are certainly elements of truth to that viewpoint, as with much of the Christian life, there is a balance that needs to be found, and that balance is to be found in a multitude of scriptures. The passage from Matthew 18 quoted above should be read in light of a similar passage in Luke. Luke 17:3-4 "Take heed to yourselves: If thy brother trespass against thee, rebuke him; and if he repent, forgive him. And if he trespass against thee seven times in a day, and seven times in a day turn again to thee, saying, I repent; thou shalt forgive him." Now the passage in Luke does not conflict with the one in Matthew, but it certainly adds more information. Obviously, without Luke 17:3-4, one would have to come to the conclusion that you are to forgive those who have wronged you no matter what.... unconditionally. But in light of Luke 17, we see that forgiving the wrongdoer 490 times would be dependant on 490 repentings (repentances?). Also note that both of these verses refer to forgiving your brother. That means another Christian. If you both have the same Father, you are brothers. Non Christians have another father, which Jesus pointed out to the scribes and Pharisees in John 8. As Bob Dylan wrote; you're going to have to serve somebody; it may be the devil or it may be the Lord, but you're going to have to serve somebody. Strictly speaking, these passages about forgiving your brother are not directly applicable to a wrong done to you by a non believer. That is not to say that a believer is free to hold a grudge or seek revenge on an unbeliever. The Bible is quite clear in Romans 12:19 where it is stated: "Dearly beloved, avenge not yourselves, but rather give place unto wrath: for it is written, Vengeance is mine; I will repay, saith the Lord." I must admit that contemplating the above verse does more than anything else to soften my inclination to being infuriated with someone who has wronged me, whether a real or imagined offence. Somehow any type of vengeance that I may contemplate pales to insignificance next to the wrath which awaits them for offending a Holy God! So, where does that leave us? An unbeliever has wronged you. What is your biblical duty? Your duty is to leave revenge (including defamation) to the Lord. Once you have made a commitment to God that you will not seek to be the instrument of vengeance, you have forgiven. If the unbeliever who has wronged you comes to you and asks forgiveness, then by all means grant him that. If you have actually left vengeance up to the Lord, as described above, then it will be easy. Lacking repentance on the part of the offending party, do you need to seek them out to let them know you have forgiven them? I don't find that in the Bible. Correct me if I am wrong. Is it necessary to resume fellowship with them, even if they ask your forgiveness? I don't think so. In fact, that may be contrary to scripture. 2 Corinthians 6:14 comes to mind: "Be ye not unequally yoked together with unbelievers: for what fellowship hath righteousness with unrighteousness? and what communion hath light with darkness?" The bottom line is that forgiveness, in all of its forms, requires that God be involved. A believer forgiving an unbeliever requires leaving vengeance to God. A believer forgiving another believer requires the same, plus repentance and a restoration of fellowship. But the big one is God forgiving me. God forgiving you. That required the shedding of the blood of his own Son. Suddenly those things that others may have done to offend us don't seem quite so serious anymore. Due to the apparent dearth of information on Flathead cam specs, I thought this might be of use to someone out there. I had a set of stock 45" cams reground by Leineweber last summer for a WL stroker I was building for a customer, and I wanted the timing specs for my records so I checked them with a degree wheel. I am listing the timing events at several different locations because it seems that I have seen the specs listed at different points from different sources over the years, and they do you little good if you cannot compare apples to apples. 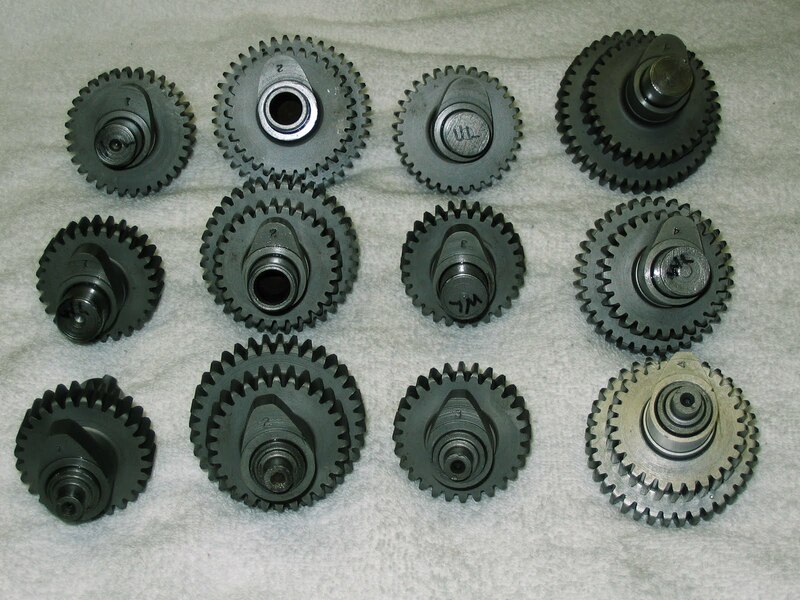 I have never seen specs on a stock 45 cam, however, and unfortunately I did not check these before sending them for the regrind. Just a note, seat timing is the least useful because it is dependant on how gently the cam starts to lift and then how gently it closes the valve, but if its all you have to compare it would be better than nothing. I included the .010" lift point simply because I seem to remember seeing it used with some other old cam specs. The .020" lift is the checking point that Jim Leineweber uses for his line of cams. The .050" is standard for the automotive industry, and the .053 check point is what most of the Harley industry uses, at least in modern times. Jim calls this regrind a .360 lift and +10 degree duration. This would give an .053 duration of 207.5 on the intake, and 208.5 on the exhaust. Notice that if you calculate the duration at .010" lift you get 266.5 duration for the intake and 270.5 on the exhaust, making it obvious why you need to compare apples to apples. For more info on cam specs and formulas here is a link to an old post I did on the subject. If anyone has any other 45 cam specs that you would like to share, send them to me (or leave them in a comment) and I will try to get them all posted together in one place. Thanksgiving. Is it a meal, or is it a holiday? Or is it a holiday known for its meal? Or is it just possibly, for some, an attitude? I am afraid that for the majority of Americans, Thanksgiving Day is no different than any other day of the year in respect to their treatment of the Creator of the universe. In other words, there will be little or no thought given to the one who gives us everything. Oh, perhaps a grandpa or an uncle who grew up when life was different will bow his head and give thanks for the meal at the family get together, but that is about it. Many will not even hear those words because they are so intent on the feast that follows. In fact, the politically correct way to celebrate Thanksgiving is to say you are thankful for blessings all the while being careful not to mention to who it is that you are thankful. That way random chance gets just as much glory as the King of kings and Lord of lords. A couple weeks back I received an email from a gentleman in Holland with a link to his bulletin board. Max and Frits are the ones who have communicated with me, and I have to say, they definitely think out-of-the-box compared to the Harley tech you are likely find here stateside. The vintage Harley motors seem to be of particular interest to them. All of you gearheads out there would do well to take a look. A couple warnings though. The site is in the Dutch language. Now my Google toolbar has the capability to translate the pages for me, and it likely will not be too tough for you to figure out how to do the same. However, even with the translation tool, it is tedious reading (at least for me), not because of how it is written, but because of the limitations of the translating tool. If you take a look, you will see what I mean. The second warning has to do with attitude. I never would have expected myself to react this way, but I find myself having to fight off the tendency to get defensive about America's pride and joy - the Harley. You know the way it goes; its one thing for me to bad mouth the technology on a Harley, just don't try it if your not from here. But a little introspection goes a long way, and it is quite obvious after a little thought that these guys are enthusiasts just like us, otherwise they would not take the time to devote a bulletin board to the subject. There is also a second warning having to do with translation. I think some comments that may come across as insulting, may be the result of the translation tool. For instance, if someone states that you are ignorant, it will certainly get your hackles up. If on the other hand the same idea was translated "did not know," then no problem. Well, at least no problem unless you always think you are the smartest person in the room. I try not to make that assumption about myself, and it usually proves to be true. Just try to read it giving the guy on the other end of the Internet the benefit of the doubt on such things and it will be a lot more enjoyable. I could quote a Bible verse here, but I will spare those of you who are here for the motor stuff. Check it out, I think you will find it interesting. Psalm 107:31-32 Oh that men would praise the LORD for his goodness, and for his wonderful works to the children of men! Let them exalt him also in the congregation of the people, and praise him in the assembly of the elders. If you are a genuine Christian, then undoubtedly there are few things in life that you enjoy more than worship of God and fellowship with other Christians. After all. isn't that why you attend church services? If approached in a proper frame of mind, it never fails to edify. Now, I love the local church where I am a member, and look forward with anticipation to each service, but let me tell you about an event that provides a similar spiritual boost. This past Saturday, my wife and I attended the annual meeting of the Minnesota Association of the North American Baptist Conference. Our hosts for the event was Bethany Baptist Church, the lone Russian language church in our association. The meeting, despite small numbers due to our first snow storm of the season, opened with the robust singing of a number of old favorite gospel songs. I quickly concluded that I was perhaps the only one there without a good voice, but no matter ....the volume was such that there was little chance that my discordant notes would be noticed or detract from the whole. churches in the association, outlining events of the past year and requests for prayer in specific areas. The pastor of the next church on the list would then pray for the previous church before presenting his report. Stories of conversions and baptisms, and of course in some cases dwindling numbers and struggles to keep the church doors open were the norm; in other words sharing one another burdens and triumphs. The opportunity to be lead in prayer by a multitude of godly pastors is a rare treat indeed. Next up was a "charge" by Rev. Tim Blackburn, our regional minister, followed by reports from some of the entities which are supported by the association, such as Village Creek Bible Camp and Sioux Falls Seminary. Also on the agenda was a sermon by Pastor Vitaliy Bak, the pastor of the host church. The message was from the book of Judges, noting some of the correlations between Christianity in our nation presently and during Gideon's day. Gideon was transformed by God from a man who considered himself the least in a family which was itself poor in the tribe of Manasseh, into a leader of the nation of Israel. God changed Gideon from one hiding from the Midianites as he threshed his grain, into the leader of an army so large that God had him send most of them home so that the glory for the victory would be God's and not man's. We were also treated to a performance by Bethany Baptist's brass orchestra, a group of about 40 youth from the congregation, who obviously expend much time in preparation for their inspiring, God honoring music. After all of the highlights, which included an excellent meal provided by Bethany's congregation, the business meeting was pretty anti climactic; as it should be. It seems right and proper for God's Churches to run on prayer and worship, with finances playing an important, but secondary role. Undoubtedly, there are similar meetings that take place across the country each year in various church associations. There is probably one for your church. In many cases these meetings are open to the members of those churches. I highly recommend that you take the opportunity to do as Psalm 107 says, and praise the Lord in the assembly of the elders. Way back last winter at the Donnie Smith Bike Show, I met a young man by the name of Aaron Thompson, head honcho at Wild Wheels Biker Webcasting. Aaron has a vision for creating video interviews of the local motorcycle scene here in Minnesota. After a some conversation, we agreed to do a piece on my shop when time allowed. Well, we finally got to it about mid summer, and now I am finally getting around to putting it up here. It wound up as three parts, the first of which is below. Be sure to check out Aaron's web site; he has a bunch of other great interviews posted there as well. Is a VOTE FOR COMMUNISM! In part one of this series, I published the results of a flow test on a stock cylinder from a '48 WL. In order to get an idea of what effect different modifications had on the process, I resigned myself to spending a lot of extra time with multiple flow tests. My first step in the process was to do a basic porting job. The cylinders were in need of new valve guides anyway, so I removed the old ones before working on the ports. In almost all cases, more flow can be obtained by doing the port work with the guides removed. Much of the "work" involved opening the intake port to a nominal I.D. of 1.250 inches. This is a modest increase in size, and I would consider it to be the minimum that one would want to invest effort into. Once the ports were cleaned up and shaped, new guides were installed and sized. Next the seats were cut for new stock size Rowe valves. 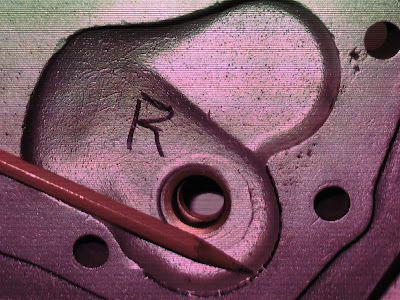 The exhaust seats received a radius seat, which in actual practice on a motor such as this, does very little. 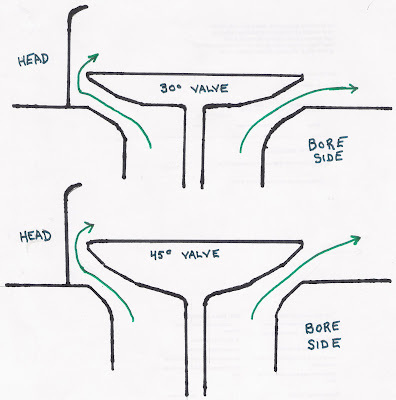 The "choke" or "venturi" just below the 45 degree seat is too large relative to the valve size for the radius to enhance the flow much more than a conventional three angle valve job would. If you lack the equipment to do a radius seat, just do a 3 angle and blend it into the port. The intake seat (only one since I would be installing larger valves next) got a multi angle seat, although this too suffered from similar size issues as the exhaust. You will note that there was actually a loss of flow under .300" lift on the intake side. This is due to the shape of the Rowe valves. Basically what they do is manufacture an exhaust valve and offer it for use in both intake and exhaust. Nothing wrong or deceitful about that. It is not sold as a performance valve, and in the long run, by reducing their manufacturing costs, Rowe is saving the owner of a stock motor money at rebuild time. 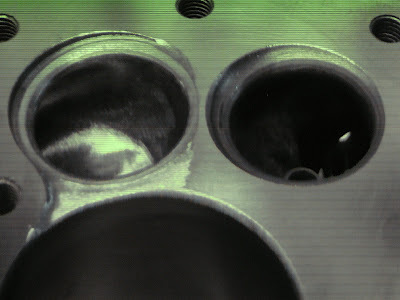 As can be seen above, adding the 30 degree back cut on the valves adds flow at all lifts, and more than makes up for the loss of flow in the previous test. At this point, for this application, the exhaust ports are done. They still outflow the intake by a substantial amount, just as they did when stock. This would seem to be the first modification that did not really pan out. The flow differences at .375 lift and below are inconsequential and would rule out shortening the guide at this level of modification. Better flow at .450 lift does nothing if your cam only lifts the valve .360" (as the regrind that this motor is getting does). I have to admit that I kind of dropped the ball on this one though, in that I did not test the other cylinder with the bigger valve before and after modifying the guide. That would have told us whether it was more viable at the higher level of modification. The increased flow at higher lifts would seem to suggest that this mod could be more beneficial with say, for instance, a larger port diameter. So, what have we learned so far? Porting work; Do it! With the little done so far we show a 13% increase on the intake at .350" lift. Just be sure that you put a back cut on those Rowe valves. 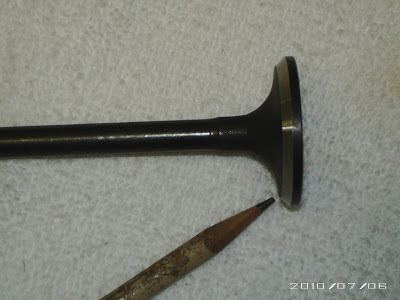 As to the shortening of the valve guide. At this point I would say no. Definitely not if you are not going beyond stock valve size. Further testing using a larger valve is in order though. Up next: a larger intake valve with step by step testing. Stay tuned. I got a call from Bill Hofmeister yesterday to report on Friday night's Knoxville Vintage National Flat Track race. If you follow my blog, you know that I am really a drag racer, not a flat tracker, so some of the details may be a little muddled, but the main points should be correct. As I have mentioned before, I did a little top end work on Billy's old iron head Sportster engined XR. 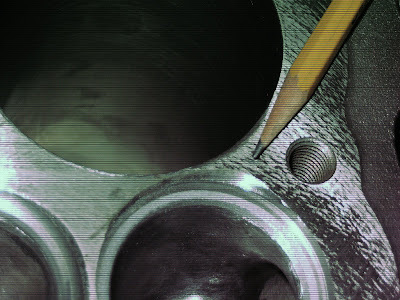 Porting, some pistons, and some modern coatings in the combustion chambers. Nothing super trick, but the things I did turned out pretty well. Bill raced the bike a time or two last summer with good results, but this spring we put a modern wet clutch in the bike, and that seems to have been a game changer. It always helps if the power from the engine gets all the way to the rear wheel! 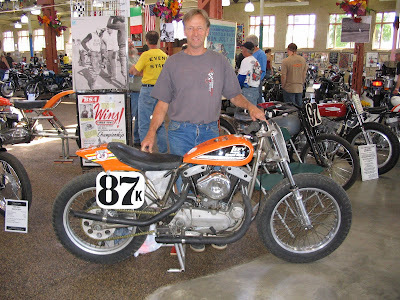 So it was off to the vintage flat track races at Davenport, Iowa as part of the AMCA national meet. After sorting out some issues with the rear chain, Bill took his XL engined XR to the "Dash for Cash," which he reportedly was leading by half the length of a straightaway when he ran out of gas. He got beat by a wheel length, dropping from the first place $750 prize money to the second place $0. No, that's not a typo. Second paid zero/ zip/ nada. But all that is just lead in for the real story. Billy brought the XR back to me last Monday morning so that I could work out a few bugs (such as aligning the rear wheel to prevent further chain problems). Since the bike showed such promise in Davenport, Billy decided to put a young gun on it for Knoxville. Since he also uses the old iron head to help promote his venture in producing street going XR replicas, he wanted all the press he could get. The young man Billy decided to put on the bike for Knoxville is National #68 Josh Koch from Cedar Minnesota. If you are not familiar with flat track racing, earning a National number plate is a really big deal. In fact, I believe there have only been about a dozen Minnesotans to win the right to a National number in the history of Grand National racing. Now, Billy is one of those riders, having held several National numbers, as well as a Canadian National Championship, however Josh not only has earned a National number; he has another advantage. He is nearly 40 years younger than Billy! It seems that Josh is presently looking for a team with an XR750 that is in need of a rider. It sounds as though Billy didn't have too much trouble talking Josh into riding for him with the lure that if he were to beat bunch of vintage XR750s while mounted on an old iron head, it should really get some attention. And that is just what he did! I took a long time to get to the punchline, but here it is. Josh Koch won the main event in the Open Class at the Knoxville Vintage Nationals on the Grand National Replica/Lee's Speed Shop sponsored lowly old iron head XR by about the length of the straightaway. How 'bout that! I have to admit, its not something I'd have given much thought a few years back. What got me onto the subject, was having a customer bring in a 45" WR (racing) motor last spring. Being somewhat unfamiliar with the nuances of such an engine, I decided I would read up on 45 engines in general on the Flathead Power Bulletin Board . Now, I have frequented the board for some time, but had always skipped the 45 section of the forum because, well, there just aren't enough hours in the day to read everything on the Internet. But now, with a new found reason, I tackled the job of reading the backlog of posts on the Flathead 45 ....well at least those with titles which indicated they were engine related. A huge task, and it has taken me some time, but I am nearly through. I was SHOCKED. Who would have expected a forum on 45 Flatheads to be such a hotbed of performance talk? That stirred my interest. Then, soon after the WR motor came in, another long time customer brought in a 45" trike motor. While the WR is here for a rebuild/restore, the trike is in need of a little more power. Well, 45 or not, that is still right up my alley. In the past I have had to slap myself to keep from doing performance modifications on an old cast iron Briggs and Stratton that I had apart for no other reason than to clean and paint it for display; sure markings of a gear head bordering on lunacy. There are two ways to modify a motor. One is to do all of the things that you think should help and then test the results. On an engine type that you are not likely to get a lot of repeat business, that is the sane way to do it. The other way is to test each modification before going on to the next. That way you find out how much each step helps, or in fact if it helped at all, or even in some case if it hurt. Its a lot more work, and you are seldom paid for it, unless you consider increasing your knowledge base as "pay." So, as if I needed to prove my insanity to anyonen else, here are the results of my first step in "porting the 45 Flathead"; a flow test of the stock ports. The next test will be with conventional porting work performed. Stay tuned. Gen. 6:5-8 "And God saw that the wickedness of man was great in the earth, and that every imagination of the thoughts of his heart was only evil continually. And it repented the LORD that he had made man on the earth, and it grieved him at his heart. And the LORD said, I will destroy man whom I have created from the face of the earth; both man, and beast, and the creeping thing, and the fowls of the air; for it repenteth me that I have made them. But Noah found grace in the eyes of the LORD." NOTE: Noah found grace in the eyes of the LORD. What wonderful words those are! Doesn't that make you long to have those words written of you? Lee found grace in the eyes of the LORD. "Your name here" found grace in the eyes of the LORD! Gen. 6:12-14 " And God looked upon the earth, and, behold, it was corrupt; for all flesh had corrupted his way upon the earth. And God said unto Noah, The end of all flesh is come before me; for the earth is filled with violence through them; and, behold, I will destroy them with the earth. Make thee an ark of gopher wood; rooms shalt thou make in the ark, and shalt pitch it within and without with pitch." God goes on to give specific instructions to Noah for the construction of the ark. I have heard it said that in modern times a scale model of the ark has been built, using the dimensions from the Bible, and found to be one of the absolutely most stable, and unsinkable shapes ever constructed. Gen. 6:17-22 "And, behold, I, even I, do bring a flood of waters upon the earth, to destroy all flesh, wherein is the breath of life, from under heaven; and every thing that is in the earth shall die. But with thee will I establish my covenant; and thou shalt come into the ark, thou, and thy sons, and thy wife, and thy sons' wives with thee. And of every living thing of all flesh, two of every sort shalt thou bring into the ark, to keep them alive with thee; they shall be male and female. Of fowls after their kind, and of cattle after their kind, of every creeping thing of the earth after his kind, two of every sort shall come unto thee, to keep them alive. And take thou unto thee of all food that is eaten, and thou shalt gather it to thee; and it shall be for food for thee, and for them. Thus did Noah; according to all that God commanded him, so did he." Did you catch that? It says that Noah did ALL that God commanded him. How important was Noah's obedience? It would seem that the fate of the whole human race depended on it. And not only the human race, but also the animal kingdom. How good a job do we do of being obedient to God? So Noah did as the Lord has commanded him, and the Lord did as he said he would. It rained for 40 days and 40 nights. The flood rose to a point approximately 20 feet higher than the tallest mountain. Every creature that lived upon the land perished, except for those in the ark. After the prescribed amount of time, the flood waters went down, and the ark came to rest upon Mt. Ararat. The story of Noah and the ark, though it is a true story, also serves as a pretty good picture of salvation. We already mentioned some things about Noah that line up with salvation. The Bible says "But Noah found grace in the eyes of the LORD." All around him was great wickedness, but Noah found grace. There is great wickedness all around us, but if you are truly a Christian, then you have found grace in the eyes of the LORD. The Bible says that "Noah walked with God." It is not possible for a person to be truly saved unless he walks with God, and walking with God involves going the same direction, and with a common goal. Noah did all that God commanded him. Salvation involves doing as God commands. In the New Testament Jesus says: if you love me, keep my commandments. I think it is safe to say that most of us fail miserably at this. But the difference is that a true Christian will try to follow God's commands and it will be grievous to them when they fail. Hebrews 11:7 "By faith Noah, being warned of God of things not seen as yet, moved with fear, prepared an ark to the saving of his house; by the which he condemned the world, and became heir of the righteousness which is by faith." Just as Noah was saved from physical death by his faith in what God told him, and his putting that faith into action, he was also saved spiritually and declared righteous before God because of that faith. The same is true today. Through faith in the death, burial and resurrection of Jesus Christ, we can also become an heir to righteousness. Jesus Christ died in our place paying the penalty for our sins, and what he gives us in place of our sins, is a share in his righteousness. And just as Noah's faith in what God told him resulted in his work of building an Ark, our faith in Christ's sacrifice on the cross, if it is real, will result in turning from our sin, and to building his Church. Remember what it says here in Hebrews. It was Noah's faith that caused him to build the ark, and it was his faith that allowed him to inherit righteousness. The work of building the ark was simply the result of that faith. The exact same thing is true for you and me. It is our faith that will cause us to turn from sin and our faith that will allow us to inherit righteousness. The repentance and good works are simply a result of that faith. If you have never done so, won't you put your faith in Jesus Christ? Won't you believe that he died in your place, and paid your penalty so that you might live? Won't you have faith like Noah? The Big Twin cams have been ground to .420" lift and +10 degrees over the stock duration. 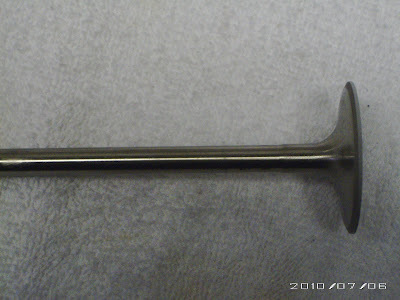 The WR (racing model) cams have been re-ground to stock specs, and the WL cams to .360" lift and +10 degrees duration. Note that the WR cams take a flat tappet, which is unusual for a Harley, which accounts for their likewise unusual lobe shape. The WL is for a trike and will be getting stroker flywheels as well as porting to give it a little extra power for a decent cruising speed. I'll try to post a little about that project as it progresses. Psalm 91 is one of the most uplifting of the psalms. Unlike so many of the others which tell of the apostasy of Israel, and God's judgment of it, this psalm is filled with strength and encouragement. The psalm begins with "Who so dwelleth in the secret of the most High, shall abide in the shadow of the Almighty. I will say unto the Lord, O my hope, and my fortress: he is my God, in him will I trust." Here we have the claim that the Christian has God as his protector. I think it is important to note a couple of words that are applied to the Christian here. Dwell and Abide. The NIV uses the word rest in place of abide. All three of these words give the same sense of a continual presence in close proximity to the Almighty. This is not a bad description of a Christian. Not definition, but description. One who spends the majority of their time in close proximity to the Lord. Just as one who only visits your home town for one hour a week could not be said to dwell in your home town, one who only visits the Lord one hour a week on Sunday morning cannot claim to be abiding in him. If a person does not spend the majority of their time dwelling or abiding with the Lord, then they do not fit the Biblical description of a Christian. As such, this psalm does not have much in the way of application for that person. Now, just to be clear, a person can certainly spend the majority of their time dwelling with and abiding in a false god ....but that would be a whole different subject. Verse 3 "Surely He will deliver thee from the snare of the hunter, and from the noisome pestilence." In the New testament, in both 1st Timothy and 2nd Timothy Paul uses the phrase "the snare of the devil." I think it is pretty easy to put 2+2 together and identify the hunter who the psalm tells us is setting snares for you. Pestilence is defined as a plague; a disease that is contagious or infectious and is epidemic and fatal. A second meaning is corruption or moral disease destructive to happiness. But for those who, as verse 2 tells us, have cried out to the Lord, placing their trust in him as their fortress, we have the sure promise of deliverance from both the hunter and the pestilence! Verse 4 begins "He will cover thee under his wings, and thou shalt be sure under his feathers:" That makes us out to be pretty weak and defenseless. Of course that is the plain truth of the matter, we are weak and defenseless, but the verse ends with this "his truth shall be thy shield and buckler." I don't know about you, but as a man, I like this analogy a lot better. Going to war with God's truth as your shield! But as manly as that may make one feel, it is important to remember that in God's sight we are just as little baby birds protected under their father's wings. Verses 5&6 "Thou shalt not be afraid of the fear of the night: nor of the arrow that flieth by day: Nor of the pestilence that walketh in the darkness: nor of the plague that destroyeth at noon day." The person who is dwelling in the Lord has no longer has reason to be afraid of the fear of the night, or as some translations put it, the terror of the night. Most of us, as we grew up, got over the fear of the monster in the closet ....or in the attic...or under the bed. But there is still that fear of the unknown. The arrow which is coming at you in the daylight, is something you can see coming, and you know it is aimed at you to do you in. But sometimes just the fear that there may be an arrow coming at you that you cannot even see ....that may be more terrifying than the one you know is coming. Obviously, these have spiritual application. I think for many, the fear of death may be the primary application. Maybe as far as you know, you are healthy. But that terror in the darkness, is that some disease you don't even know you have will suddenly kill you. Or the plague that destroys at noon day is that disease that you know you have and you know its only a matter of time until it gets you. But if God is your fortress and your hope, then you will not be afraid. Notice that the Lord does not promise us that we will not fall victim to the arrows or the plagues, because we will. As 1 Corinthians 15:26 tells us, "The last enemy that shall be destroyed is death." We are not there yet. But we need not be afraid! Verses 7,8&9 "A thousand shall fall at thy side, and ten thousand at thy right hand, but it shall not come near thee. Doubtless with thine eyes shalt thou behold and see the reward of the wicked. For thou hast said, The Lord is mine hope: thou hast set the most High for thy refuge." This is a reference to judgment. It brings to mind the first Passover as described in the book of Exodus. Thousands of Egyptians perished while the children of Israel who had the mark made by the sacrificial lamb's blood on their door post were spared. The same will be true in the future when the wicked are rewarded for their deeds on judgment day, but those whose hope is in the blood sacrifice of Jesus Christ, will be spared. Continuing with verse 10: "There shall none evil come unto thee, neither shall any plague come near thy tabernacle. For he shall give his Angels charge over thee to keep thee in all thy ways. They shall bear thee in their hands, that thou hurt not thy foot against a stone." "Then the devil took him up into the holy city, and set him on a pinnacle of the Temple. And said unto him, If thou be the Son of God, cast thyself down, for it is written, that he will give his Angels charge over thee, and with their hands they shall lift thee up, lest at any time thou shouldest dash thy foot against a stone. Jesus said unto him, It is written again, Thou shalt not tempt the Lord thy God." We, also would be wise to heed that warning not to tempt the Lord our God. Back to Psalm 91, verse 13: "Thou shalt walk upon the lion and asp: the young lion, and the dragon shalt thou tread under feet." It is interesting that in the New Testament, the devil is referred to as a roaring lion, as found in 1 Peter 5:8 "Be sober, and watch: for your adversary the devil as a roaring lion walketh about, seeking whom he may devour:" In the book of Revelation, the devil is identified as "the dragon" (Rev 20:2). Also in Revelation, the devil is referred to as "that old serpent" (Rev 20:2), and whether your text uses the word asp as found here in the Geneva Bible, or adder as found in the English Standard Version, or cobra as found in the NIV, they are all clearly speaking of a snake. Don't you find it marvelous how the Bible all fits together so well? Here we are looking at a text right here in the middle of the Bible in the book of Psalms, and we find another text that ties in perfectly and helps explain it in the very last book. So now how can we help but at least mention how they both fit perfectly with a text in the very first book of the Bible? Genesis 3: 14&15. You all know the story of the Garden of Eden. God commanded Adam and Eve not to eat of one certain tree. Satan enticed Eve into eating of it, and Adam joined her. "Then the Lord God said to the serpent, Because thou hast done this, thou art cursed above all cattle, and above every beast of the field: upon thy belly shalt thou go, and dust shalt thou eat all the days of thy life. I will also put enmity between thee and the woman, and between thy seed and her seed. He shall break thine head, and thou shalt bruise his heel." I think it is safe to say that most scholars agree that this is God's promise of a coming Messiah. Christ is the seed of the woman, and as it says, his heel was bruised at the cross by Satan. Jesus suffered a cruel death on the cross paying for our sins, and yet in that very same act in which his heel was bruised, Christ crushed the head of the serpent. It was in that act of redemption that the power of sin was broken. Back to Psalm 91. By verse 14 it becomes evident that the psalm has switched from being written in the third person to quoting the Lord. In fact, the NIV adds the phrase "says the Lord" which isn't found in the other translations that I looked at. Verses 14-15 "Because he hath loved me, therefore will I deliver him: I will exalt him because he hath known my Name. He shall call upon me, and I will hear him: I will be with him in trouble: I will deliver him, and glorify him." In many ways, these last few verses, bring us back to beginning of the psalm. God promises that he will hear us when we call on him, but we call upon him because we are abiding in his shadow, because he is our hope and our fortress. He promises to be with us in trouble and to deliver us because he is our God and we have put our trust in him. All of these great blessings and promises can be ours if only we would see ourselves as the wretched sinners that we are, and put our faith in Jesus Christ and his payment for our sins as the only means of reconciliation with God. The psalm ends with this line: "With long life will I satisfy him, and show him my salvation." In closing here is the footnote on this last verse as found in the 1599 Geneva Bible. "For he is contented with that life that God giveth: for by death the shortness of this life is recompensed with immortality." Here is a link that I have been meaning to put up here for some time now. 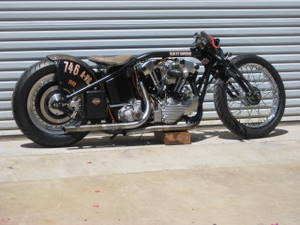 A while back I had a conversation with Dave Iverson of Iverson Originals about his LSR (Land Speed Racing) Knucklehead. Of course I took so long to get to it, that I have already forgotten some of the details, so best to let Dave's web site speak for itself. I borrowed this pic from Dave's site just to whet your appetite! I think you will agree that Dave and his crew have done the Knucklehead world proud with their outstanding accomplishments using a small displacement single carb motor. Proverbs 18:22 tells us that: "Whoso findeth a wife findeth a good thing, and obtaineth favour of the LORD." This was brought home again to me recently. For a while now I have felt something lacking in my monthly preaching stint at our local retirement home. My wife was able to attend the service in July, and was quick to critique me. "It was too long and too deep. You need to preach on Bible stories that they are familiar with. You lost most of them in the first two minutes." Obviously she was right (and she loves to hear me say that). Many of those who attend the service seem to be slowly slipping back to a child like intellect. The following was my first attempt at following my wife's advice, and from what I could tell, it was a big improvement. Most of us have known this story since we were youngsters attending Sunday School. It is the story of how God tested Abraham. I have an old friend that I once tried to witness to. His stated reason for not being a Christian, had to do with this story. He said that any God who would ask a father to kill his own son was evil, and he wanted nothing to do with such a being. We can find several good answers to this charge right here in this story, but I believe the best is this. Way back in Genesis 17, God makes it clear that it would be through Isaac that Abraham would be a father of many nations. Abraham had to have had that promise of God in mind as he set out to follow the instructions to make this sacrifice. If Isaac did not live long enough to take a wife and have children, it would make God a liar. We don't know what Abraham expected to happen, but we do know that he trusted God's word. Another thing I would like to point out is that this act of obedience on Abraham's part was not what made him acceptable to God. As it says in Genesis 15:6 and in thee separate books of the NT, Abraham believed God and it was counted as righteousness. (Gal. 3:6, Rom. 4:3, James 2:23) This was long before Abraham had a son, and in fact it was his belief in God's promise that he would have a son, which was counted for righteousness. That is what made Abraham acceptable to God; faith in God's word was counted in place of Abraham's own righteousness. In God's eyes, our own righteousness, our own right acts; our own good deeds are as filthy rags as the prophet Isaiah tell us. The obedience displayed here by Abraham, was just a proof of his love for God, just as all of our good works after salvation are only a proof of our love for God. Clearly this incident in Abraham's life is a picture of the sacrifice for sin which Christ made. I think that the location of this event is very significant. In 2nd Chronicles we find that the temple was built by Solomon in mount Moriah, which puts mount Moriah at Jerusalem. Note that in this account of Abraham's testing, he is instructed to go to Moriah, to a specific one of the mountains there. I believe that the mount to which God directed Abraham, was the very same one where Christ was crucified. When we think of this story of Abraham and Isaac, we should not just look at it as a testimony of Abraham's obedience. Since it is a picture of Christ's death on the cross, this story should also serve as a reminder of the inconceivable love God has shown for his children. As we consider Abraham's situation wherein he was to offer his son as a sacrifice, it is difficult to comprehend, and yet this is much the same situation that God the Father faced. His only son suffered and died to pay the price for our sins. That is amazing love. The Bible says that Abraham believed God and it was counted for righteousness. John 3: 16 says, "For God so loveth the world, that he hath given his only begotten Son, that whosoever believeth in him, should not perish, but have everlasting life." If you believe that, then God will count your belief for righteousness.